Almost the trees are dead! This random map script is somewhere between Black Forest and Sherwood Forest. There are more passages through the forest than in Black Forest but the trees are denser than in Sherwood Forest. But the most important difference is that most of the trees are either dead or dying. Resources are similar to the standard set, however some of them may be harder to find because they are hidden in the forest. Plus you get lots of extra deer. Note: The trees give you 125 wood each instead of 100, but they cannot be destroyed with siege equipment! Is there enough space to build? Is there anything I should add or remove? I would love to get some feedback. In line 662 you wrote "nin_distance..." instead of "min_distance...". But not sure how important that is since it doesn't crash the map. As you noticed, it was not a game-crashing bug, but I fixed it, so now broken carts won't appear too close to each other. Great!!! And there is a Gigantic Map? 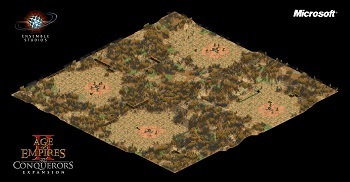 I saw the Gigantic Map in game Age of Empires 1. (http://aoe.heavengames.com/dl-php/showfile.php?fileid=2)Do not tell me it is suitable for Age of Empires 2?